It comes as no surprise that Australia is regarded as the best immigration destination. Every year, thousands of people from all over world apply for Australia permanent residency to get settled in the country. However, the first step towards the Australian PR is to know whether your occupation falls under the skilled occupation list or not. Australia has a long and proud history of welcoming overseas skilled workers who can fuel the country’s economy and become a part of its social diversity. Therefore, it’s important to choose an occupation that not only guarantee you a visa, but also boost your chances of permanent residency. Here is a list of which are highly demanded in Australia occupations, so take a look at them before you jump into the Australia PR process. Australia needs accountants, with many companies looking for efficient and highly-skilled accountants who can manage day-to-day accounting activities. As finance and accounting are the integral parts of an organization, the growing demand for this occupation is here to stay. So, if you are an accountant, then huge opportunities are waiting for you in Australia. It will help you land in a good job as well as PR to Australia. Australia is a great hub for engineers, including mechanical, civil, electronics, industrial, and software. Overseas workers who have an experience of working in these professions have higher chances of Australia immigration along with a well-paid job. Working as a nurse can be a rewarding experience in Australia. 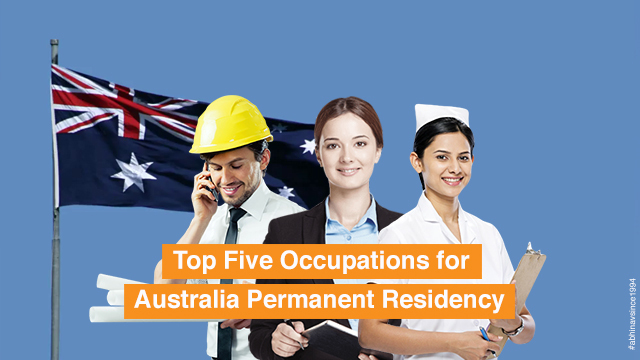 The profession is highly-regarded in the country and presents big incentives to people who wish to move to Australia and get settled there permanently. So, if you are a nurse and feel passionate about helping others then you should think of migrating to Australia. Australia features a world-class education system and is lauded for investing a lot in the education and training sector. People with considerable experience in teaching may choose to settle in Australia as the country is facing a shortage of skilled teachers. If you are an electrician or skilled tradesmen, then prepare yourself for a rewarding career in Australia. As per the current scenario, the Australian government has kept the above-mentioned professions on both medium/long-term and short-term Strategic Skills List. Hence, all prospective immigrants who have the experience of working as a tradesman or an electrician, and meet other requirements, have better chances of finding a suitable job in Australia. Does your occupation fall in the skilled occupation list? If yes, then don’t wait much. Apply for Australia Permanent Residency today and prepare yourself for a better future. Great Opportunity for Civil Engineers in Australia to Get PR Visa! What is the step by step procedure to apply for Australia PR?